City Projectour is an hallucinatory walking assistant to get you through Times Square. Traverse space, time, and the circles of hell with projector as guide and city as canvas. Explore Times Square as a participatory haunting, battling big city lights and jumbotrons with a pocket-sized portal. Through the use of sound and light, City Projectour layers allegory and archive on top of real time environment to activate spaces, create connections, and elicit a deeper reflection on the many faces of the planet’s most popular destination. Ultimately, City Projectour strives to reclaim the experience of Times Square from passive spectator consumed by corporate billboard tsunami to active performer equipped with the power of light and the embodied action of placemaking through walking, featuring the greatest co-star in the world: New York City itself. City Projectour is a mashup of media edited MTV-style, presented through the ephemeral interface of portable projections. Participants hear and see this collage of mixed media as they journey along a predetermined circuit in Times Square, from underground to street level. The result is a recontextualization of their experience of Times Square, creating an immediate and unique interplay between layers of the recorded and the reality. The portable projector comes loaded with a track list of audio and visuals designed for each spot along the mapped route. While the area and content is dictated, it’s up to the user to decide how to cast the projections on the constantly changing canvas of the surrounding world. 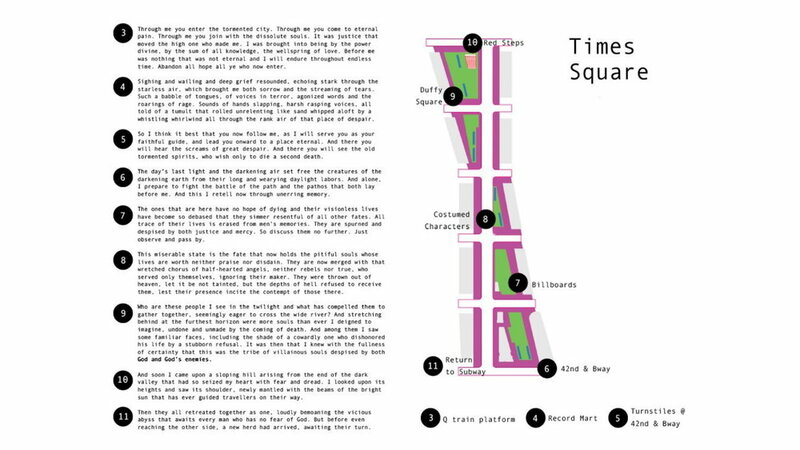 Through this act of urban interaction, City Projectour explores the question of what it takes to make a walk through Times Square enriching, rather than frustrating, to the average New Yorker. I’ve been seeking a thematic thread to weave my domains together and to inform the visuals and narrative of my project. So at this point, I’m pivoting from research on urban interaction, cartography, and projection mapping, and exploring topics such as light and shadow in the city since my medium is projected light. Lesson learned about X (this is the thematic thread). A greater appreciation for the city as space for interaction with both people and structure + greater awareness of their own input/output in the vibe of the city. Projection art as handheld, mobile medium is effective in bringing everyday spaces to life in a new way. It’s accessible and deserves greater exploration. I’m interested in mapping rhythms of the city, especially those that are hidden or overlooked in some manner. With my artistic practice currently taking the form of mobile projections, I’ve been considering the rhythm of sunlight and shadow in New York City, and how the movement of these elements interacts with our buildings and infrastructure, influences our paths within space, determines the appeal of real estate, and generally creates a sense of place. I think about the privilege of natural light in a city like New York; how rising towers create stunning penthouse views and long, looming shadows over those below. I think about friends who’ve lived in “bedrooms” deemed illegal for their lack of window, and my own experience living in a lofted studio where the loft was so cave-like my circadian rhythm changed. I think about how it’s the shadows of the financial district that conjure feelings of walking the medieval streets of Siena, Italy, despite the stark contrast between architecture and age of the two locales. This exploration in city light led me to the archival audio of a radio broadcast from the 1965 power outage in NYC. What a treasure. I’ve been wanting to integrate my practice in remix/mashup/collage, but I only really considered that from a visual standpoint: thinking about how multiple people with mobile projectors could work together to complete a single image with their different projections. I’m not there technically, so I’m tabling that for the moment as I work on concept. After listening to this archival broadcast, I was inspired by its visual imagery and the potential for remixing its dialogue to draw parallels between the power grid and political/social power. I’m thinking about how reliant we are on the power grid and on light, and thus how vulnerable that makes us to attack or abuse. Then I started to think about creating a mobile narrative experience like War of the Worlds, speculating on what would happen if there were a massive attack on our power grid. What would it be like to create an audio piece that tells this story and guides people through the dark city with a projector. What kinds of explorations motivate your creative practice? Explorations in sound and image and the alchemy that arises from the combination of the two. Identifying fissures in facades and drilling down into them to see what lies at the origin of the divide. Studying the creation of place from space and finding a way to distill or identify the active ingredients. The act of walking and wandering as means of urban interaction. The use of projected light to bring [non-flat/non-screen] surfaces to life and facilitate a richer interaction with landscape or environment. How narrative can be created from embodied mapping. What conceptual, aesthetic, and technical questions drive this project as a whole? How can light and sound be used to facilitate a richer interaction with our city? What unique opportunity or value lies in the technology of portable projectors to activate our surroundings in an ad hoc manner? Does this handheld technology afford a sense of freedom and joy and improvisational creativity or does it fall short? Are there too many restrictions to the technology? Would something like AR be better suited to interact with our environment? How can sound be used to dictate experience both directly and indirectly. What concept should drive the visuals if the ultimate goal is to foster a greater interaction with and appreciation for the city’s mutability? What is another conceptual thread I can weave into the experience that might inform the visuals and overall point of view? How can a collage aesthetic be used to evoke the cultural patchwork quilting of the city? What are the core uncertainties of your investigation? Core uncertainties lie in identifying the real question or point at the heart of the project. What am I really trying to say? What/how do I really want the audience to feel and think? How is this work contributing to the greater domain of urban interactive design? Are there key qualities that you would like your project to have, or that you’d like it’s user / audience to experience? Key qualities for the audience include a sense of creativity and control; they have agency in where and how the visuals are projected (context, scale, motion). There should be a sense of playfulness, magic and wonder, discovery and inventiveness. I want the visuals to act as enhancements to the city’s facade, rather than distractions from. So the visuals must be engaging without being distracting from the city itself as player. I want the feeling to be one of city-as-canvas; infinite possibility for creative combinations and interactions with the space. Conceptually, I am studying urban space and perambulation as a means of place-making. Formally, I'm experimenting with the use of surreal visual projections, soundscape, and guided audio tour to facilitate a layered experience of walking the city and participating in its patchwork quilting. I'm exploring this concept and form as a response to claims that our culture of street life and our interaction with urban space are being diluted by technology's encompassing grip on our attention and operation. This project should provoke interaction with the city in a way that highlights both the value of street life and the cost of eroding it. I aim to create a rich, interactive, urban intervention in which the audience is encouraged to more consciously engage with the city, more attentively look at and listen to its rhythms, recognize its patterns, improvisations, and anomalies, its pathways and blockades, its textures, materials, lines, shapes, and edges. This project uses open-ended audio prompts to walk users through the city. Users are equipped with portable projectors loaded with visuals to be projected onto the city's many faces, per the prompts. Intended to be experienced as a duo or group, the tour intentionally varies the visuals loaded on each projector, so that users bring different elements to the same space, combining them as they please to create harmony or tension. In this way, I seek to use the aesthetics of collage to tap into the patchwork quilt effect of vibrant city life. If I am successful, the project will result in an ephemeral, multi-layered compilation or collage on the city-as-canvas, which inspires lasting dialogue, delight, a keener sense of being in the city, and an appreciation for the collision of elements that transform space into place. This project is important to me because walking the city has been an important practice to me for decades. Much is learned about myself, my community, and the greater surrounding world through simply walking the streets and consciously experiencing the city. To have presence of mind while navigating the city is to contribute to the city's feedback loop, which actively shapes both citizen and city. More frequently, I see people siphoned off from urban interaction by headphones, iPhones, private car services, GPS, rising residences in skyscrapers, and door-to-door deliveries of everyday commodities. I fear the toll this takes on culture and humanity. This project is important to my target audience because, whether conscious of it or not, the forces at play on our psyches and our being derive from our environment and how we navigate the spaces we inhabit. Those interactions actively shape the space in turn. City life is increasingly relevant to the average person, with more of the world's population gravitating to urban hubs. This expanding relevance means there are more eyes on the city and more hands in the pot, vying for financial stake, political control, and cultural influence. It's important to participate in the shaping of our cities at every level, which starts with more active interactions, sensing our cities more acutely, knowing our cities at the human scale. -Also breaks monotony of everyday by actively wandering, seeking new information with or without intent beyond meander; allow yourself to get lost instead of treading same trail day in/day out, hardened by the harshness of new york city, blinded by the repetition. “If it is true that a spatial order organizes an ensemble of possibilities (e.g., by a place in which one can move) and interdictions (e.g., by a wall that prevents one from going further), then the walker actualizes some of these possibilities. In that way, he makes them exist as well as emerge. But he also moves them about and he invents others, since the crossing, drifting away, or improvisation of walking privilege, transform or abandon spatial elements.” (98). -sentience of the city: what does it know? What is its intelligence? Where can we see the collected data of our input? What rhythms emerge? -city projectour as facilitator to conscious exploration/experience of the city; encourage richer participation in street life, balancing output/input.